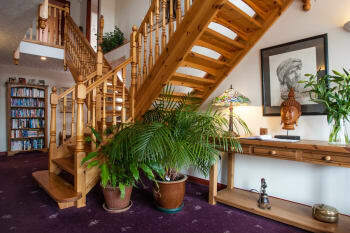 Dunhallin House is a newly refurbished 4-star guest house set in the city of Inverness, the Highland capital. This adults-only house has five en-suite rooms for guests to enjoy: all the rooms are doubles and two can be configured as twins. Additionally, four of the rooms are of above-average size for a guest house. All rooms have flat-screen televisions with DVD player, digital radio with docking station and courtesy tray. Other facilities include ample off-street parking, locked storage for bikes, golf clubs etcetera, and drying facilities for walkers and cyclists. The aim of Sandy & Margaret, the owners, is to deliver exceptional service in comfortable and relaxing surroundings and to ensure their guests feel they are visiting a 'home from home'?The satisfaction of our clients is their top priority and they strive to ensure that happy memories of Dunhallin and Inverness stay with you for years to come. Groups: Groups are accepted up to a maximum of 10 people. No stag and hen groups. The owner of the establishment was very very friendly always so helpful the room was immaculate everything we needed was there the food was extremely beautiful we enjoyed our 2 day stay there so much location was perfect . The city shopping was amazing every kind of shop you need and lots of lovely restaurants in the area and also great pubs . This guest house well deserves it’s four stars. From arrival to departure every possible comfort and assistance is available in Dunhallin. The house itself is stunning with large rooms in a very quiet area of the city. It’s well sound proofed and I had a relaxed and peaceful nights sleep. Breakfast menu is very wide with spending to tempt everyone. The challenge was to make a choice when there was so much I’d like to try. This place is within walking distance of the town and not far from Asda if you have forgotten anything. Extremely friendly environment made for a wonderful stay. Beautifully presented. We would highly recommend this facility. Limited restaurant facilities within walking distance however easy drive to many more makes this B and B a great place to stay. Warm welcoming hosts, good location with easy access to city centre via bus/taxi. Clean, spacious and comfortable rooms. Excellent quality breakfast and service overall. We enjoyed our stay here and would highly recommend it to anyone else. Another great stop-over, with Sandy and Margaret super friendly hosts. And a great breakfast and very comfortable room. A big thank you for everything !!! Very friendly hosts and extremely comfortable stay. Breakfast superb with a fantastic choice. Excellent B & B, beautiful room, wonderful breakfast, excellent service. I often stay in Inverness on business, this is without doubt the best B & B I have stayed in. 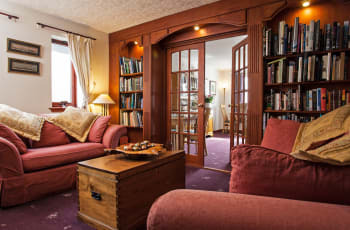 If you are looking for a B & B in Inverness, you won't find better than Dunhallin House. A warm and friendly greeting on arrival and made to feel very welcome. Cosy and and very comfortable room with the best bed and bedding I’ve slept in a long time, a fantastic nights sleep. Will definitely return when I’m in the area and would recommend to anyone. A late arrival but a very short drive to local restaurants etc. Absolutely lovely B&B. Very clean and comfortable bedroom. 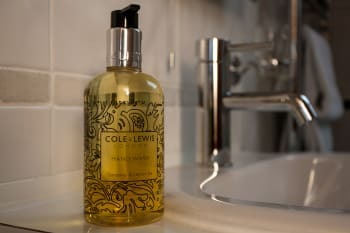 Bathroom spotless with lovely products. Hosts were so friendly and accommodating - they made me a delicious packed breakfast as I had to leave so early to catch my flight home. Would highly recommend. Sandy and Margaret were wonderful hosts. Very friendly greeting and were very attentive to our needs. Thankyou for making our short stay a memorable one. The city can be walked but would suggest taking the car. We parked at the long stay cathedral car park which was £3 for 4 hours. Excellent guest house. Margaret and Sandy are great hosts. One word to describe Dunhallin House -PERFECTION. Book this Guest House and you won’t be disappointed. Margaret and Sandy were wonderful hosts. Dunhallin House is lovely and extremely clean. We mentioned we were going to Isle of Skye and they offered to pack us a breakfast. They packed us some delicious croissant sandwiches, along with fruit and yogurt. We were so happy to have this the next morning. Overall, we had a very pleasant stay. The breakfasts were delicious each day. If going to Skye, leave very early and stay more than a day. Ferry Glen is not far away from the Dunhallin House and is a beautiful short easy walk to the falls. Worth the trip. Culloden Battlefield is very interesting and has a beautiful view. Very helpful, food was excellent and plentiful. a very pleasant stay . A very friendly and comfortable place to stay in Inverness. Thanks to Margaret and Sandy, who were so helpful in many ways, also with advise where to have good dinner or great Walking tour. Fig and Thistle Restaurant is superb, and later for live music go to Hootananny. The homemade fresh to order breakfast was so good! Service was over the top. Helpful with our bags and taxis! Never been to Scotland before we picked the best place to stay in Inverness. This B&B is out of the big city hussel which was great for us, but still able to get to where we were going. In the room was an Inverness visitors guide. That was so helpful!! And it’s up to day 2018/2019. We only had two nights there and because of Dunhallin Guest thoughtfulness we were able to plan and do everything we wanted to do!! Will be back to this hotel!! I've never come across a more accommodating host than Sandy - he was truly welcoming. The room was lovely, tidy and well presented. Breakfast was amazing. It would have been easy to cut corners in what was served but it was top-notch. I'd happily stay there again, should I ever venture to Inverness and surrounds. Great place with a walking distance to the city center. Good parkering facilities in front of the house. Very nice place with everything you need. Just would have liked it a little closer to downtown. Very helpful with advise about area. Great breakfast and nice touch of sherry at evening. Lovely house and hosts and very convenient for my needs. I'll probably be back again! If you are sensitive to smells, ask them not to use the laundry freshener they use on the sheets. I didn't know they used it and ended up having to sleep on the leather couch. Not comfortable, but also not their fault - I'm ultra sensitive to perfumes. Beyond that, I highly recommend Dunhallin house. It has a good location, wonderful rooms, and they were overly generous with packing us a breakfast because we had an early departure. Appreciated the extra help owner provided upon arrival. Great breakfast. Other than being a long walk from the city, the Dunhallin House was very good. The breakfasts were excellent. Very friendly and helpful. We enjoyed our stay with you and would definitely come back. Thank you. Fantastic staff and a wonderful stay. Highly recommend! A bit of a walk to downtown but worth it. Lots to see and do. Spotlessly.clean and extremely comfortable. Lovely bedroom. The breakfasts were excellent. Everyone was incredibly friendly and helpful. Very beautiful place to stay. Sandy, the host, was a great advisor on what to do! Loved staying there! The accommodations were very comfortable and quiet. Breakfasts were delicious. We appreciated the great attention to detail such as the fresh herbs and the light at the mirror in the bathroom. Hosts were very helpful. Appreciated Sandy freezing our waters for us. We were so pleasantly surprised with how wonderful this place was. Thank you! Short drive to all the sights, but in a nice quiet neighborhood. Highly recommend this place! Very comfortable house and the owners went out of their way to may our stay the best it could be. Very accommodating. Good breakfast, comfortable and spacious room. Just what we needed. Lot's to do in the area. We were on a golfing holiday so that was our main focus and courses in the area are top notch. Sandy and Margaret go out of their way to assist travellers. They are fabulous hosts. If travellers want to be downtown, this is not the location for them. If you want a quiet neighbourhood and easy access to downtown by car as well as the environs of Inverness, book here. This was a wonderful place to stay and very affordable. We had never been to Scotland before, and Inverness was one of our stops up toward the Highlands. The Dunhallin House was very clean, beautiful on the inside, and our breakfast in the morning was very awesome! The owners were super friendly and very accommodating to anything we needed. The house has a nice lounge area with a library full of books if you want to sit there and read before bedtime. It is a great place to stay when you are in the area. Highly recommended! Absolutely stunning house. Margaret, our hostess was extremely gracious and couldn’t do enough for her guests. Her breakfast menu had everything you could want. She also offers a very nice and well appointed sitting room for guests who do not want to stay in their rooms but have a place to read or chat with other people. It is a little too far to walk to the center of town if you are elderly but the young could do it with no problem. However, there is bus service. We enjoyed our stay there very much. I would highly recommend staying here. We spent three wonderful nights at the house and couldn’t have been more pleased with our stay! The room was cozy and very clean, and the breakfast was excellent! We especially enjoyed browsing your library along with a nice glass of scotch. Thank you for the hospitality, we would definitely recommend Dunhallin House to anybody who would like to spend a few nights in Inverness. Lovely welcome and catered really well for my dietary requirements of being gluten and dairy free. Very large breakfast. Beautiful home, great, breakfast, pleasant hosts and close to city centre. Reastraunts Number 27 and The White House are very good. Very comfortable and spacious bedroom. Delicious breakfasts and friendly staff and owners. Very comfortable establishment. No good restaurants nearby - but taxi service very efficient. Very friendly welcoming staff. Nothing too much trouble. Large room which was very clean. Breakfast was great. Location was perfect. Margaret was a lovely hostess; and the breakfast was fantastic. We enjoyed the modern and stylish B&B with spacious rooms and lounge where we felt like at home. The breakfast, with pre-order, was delicious. Very comfortable room and large bathroom. Great hosts that made us feel very welcome. Great breakfast. Das war die beste Unterkunft, die wir hatten. Die Gastgeber waren super freundlich, hilfsbereit und erfüllten alle Wünsche. Das Zimmer war hervorragend ausgestattet und sehr sauber. Wir können die Unterkunft wärmstens empfehlen und würden jederzeit gerne wiederkommen. Staying here gives travelers a true feeling of visiting Scotland. The owners treat you as though they are your aunt and uncle. They were very warm and accommodating. It is located about 2 miles from town, but the walk to and fro on the river front is beautiful. The only 2 recommendations I would give are 1) it would be nice to have a larger patio area accessible to guests and 2) bikes for guests to borrow during their stay would be wonderful. Breakfast was tops! Our room was very comfortable and spotlessly clean. Breakfast was delicious and our hostess was a sweetheart. We truly enjoyed our two nights there. Lovely large bedroom with plenty of drawers etc.bed was comfortable and room was warm and spacious. Bathroom was well appointed. Breakfast was very nice with scrambled eggs made fresh......(so many places do microwave).. hosts Sandy and Margaret were great. A short trip to town or walk to Fairway golf course for food and shopping. Room was immaculate and very large. Just a short drive to the Inverness city centre. Margaret was very welcoming and the breakfast she prepared for us the next morning was the best of our trip! Would definately recommend! Excellent service - thank you very much. A good centre from where to explore the area by car. A very comfortable stay with a warm welcome and delicious breakfast. Excellent hosts with good recommendations for dining out. Very convenient location and an easy walk into the city centre. It has been a great experience! The house is really cozy and the decoration as well. The host is so lovely and kind. The breakfast is absolutely fresh, home-made and delicious! I wish I could come back one day! We very much enjoyed our stay. Thank you. Nice house, nice and beautyful room and a perfect breakfast! It was a great place to rest after such a long flight. Very clean and comfy bed! Asda superstore is just 5 mins walk away. Gotta take a bus to wherever u wanna go. Bus shelter is about 3mins walk. Lovely room with everything you would require for an overnight stay - bathroom products/tea/coffee making facility - bed was very comfortable. The hosts were most welcoming - a home from home. Breakfast was cooked to order with cereals/juices/yoghurts to start. Thoroughly recommend this guest house! This was the start of our visit to the North West Highlands so we did not spend a great deal of time in Inverness itself. Very welcoming hosts. 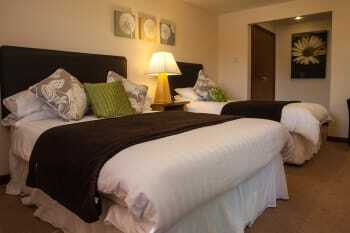 Very high standards are on offer including the large well appointed room and lovely freshly prepared breakfast. I have stayed away for 2 nights a week for the last 30 years and this accommodation is right up there with my favourite places to stay. Lovely place, and nice people. We found our stay to be so enjoyable. Margaret and Sandy are wonderful hosts and create stellar breakfasts. Inverness is a lovely little city. Thank you, Sandy and Margaret, for your warm welcome and great service with a smile. My room was very comfortable, clean and warm and the easy parking was appreciated. You provide a wonderful breakfast, and the fruit salad was so delicious! I will definitely stay again when arriving on an evening flight. Very welcoming and wonderful hosts. Lovely, large bedrooms and fabulous breakfast. Friendly and helpful hosts. Perfection. Highly recommend this B& B to anyone staying in Inverness. A most relaxing stay. Lovely room and ensuite. Tasty breakfast. And very friendly hosts. Quiet location with good parking. Easy access to main road in and out of town. Superb B&B. A personal welcome by the owner. Room exceptionally clean and comfortable. Hospitality tray with lovely goodies. A fridge with fresh milk. No problem asking for an early breakfast which was delicious and well presented. This will be my B&B in future when visiting Inverness. Excellent room, spacious and very comfortable. Breakfast choice was outstanding, Porridge was delicious, as was the cooked breakfast. Wonderful friendly hosts, we have unearthed a wee jewel in the highlands. Highly Recommended. Only a twenty five minute walk from the city centre, plenty of bars and restaurants en route. A wonderful environment with superbly accommodating hosts. More than a B&B. More like a small hotel with travel themes. Sandy and Margaret both went above and beyond when an unexpected medical emergency required an additional fee nights stay. Accommodating and amenable. Would like to return! A very nice room,friendly service and a good breakfast. Very convenient as a stopover when traveling the A9. Shops and pubs within walkimg distance. Very friendly people and a lovely place to stay. The golf club was an easy walk and good dinner. Walking into town was also easy to do. a lovely room and atmosphere with good facilities. Friendly and warm welcome. This delightful jewel of a B&B can't be recommended too highly. The whole place is welcoming from the start, parking in front of the house is easy and the entrance hall is beautiful and spacious so lumbering in with heavy bags isn't a struggle! The room we had is reached by it's own little entrance hall which is a lovely touch, with clean white walls and lovely artwork and craft pieces to dress it. The bed was firm, VAST and very comfortable, roman blinds hide the outside light very well. The basin, toilet and shower are compact but fine in use. If you've eaten and don't want to go out, go and browse the books in the sitting area. Cozy, with bookcases to die for and more craft pieces, I particularly liked the huge turned wooden bowl made from a beautiful piece of galled timber! In the morning came the final blessing of the stay, the breakfast! A fantastic fruit salad with enough chopped mint to give a hint but not overpower the fruit, followed by an excellently cooked full breakfast of egg, tasty sausage and fabulous bacon with mushrooms. The breakfast choice is wide ranging, with porridge, just eggs,smoked salmon, lots of choices and cereal available for those who can't face the fabulous fry-up! At £69 a night, which is what we paid, it's a steal. The people who run it are so friendly and helpful too, welcoming and pleasant! it's a half hour walk from the town centre, with plenty of evening meal choices, we loved Aspendos, the Turkish restaurant, but you've got lots of choice, and a taxi back is cheap a a fiver, roughly. Loads of things to do and see in Inverness, get a guide book for a proper intro, but even the walk in was lovely, great views over the town in the dark, lights blazing. Very nice couple. Made us really welcome. Lovely house in a nice quiet area of inverness. Not too far from shops,clubs,pubs and all other entertainment. Margaret and Sandy were extremely helpful. They packed us a huge generous breakfast to take away as we needed to leave early. The home is clean and welcoming and we'd definitely stay again. 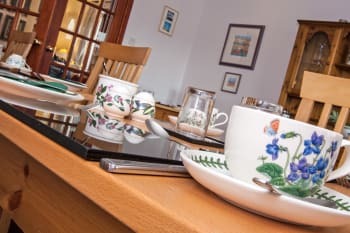 We were greeted very warmly, shown to a first class room and given extra biscuits so we could enjoy a cup of tea before we went out for the evening, our breakfast next morning was excellent, in fact more than we could eat, we would highly recommend this Guest House. My wife and I have just returned from a very pleasant stay in the Dunhallin House Inverness, we were given a very warm welcome on arrival, our room was exceptionally comfortable and clean with a separate seating area and all of our needs taken care of. There was a varied choice on the breakfast menu, hot food cooked to order with generous portions. The hosts are friendly and accommodating, we certainly would have no hesitation in recommending the Dunhallin House to friends and family and will be using it again in the future. A wide choice of restaurants and places to visit in Inverness and surrounding area. Wonderful experience!!! Well worth the price and location was very convenient. Owners were very accommodating and pleasant. Dunhallin House is a beautiful B & B in Inverness. The home is nicely decorated and the room was very clean, Comfortable and up to date. A delicious, large full Scottish breakfast was prompt and a very nice way to start the day. About a 25 minute walk to downtown (downhill). Highly recommended. Cafe 1 is a first rate restaurant. Very nice room, quiet neighborhood, friendly and accommodating staff. Very comfortable stay at Dunhallin House. Attentive hosts, lovely breakfast. All the little extras were thought of. Close to the Asda for supplies. It is about a 30 minute walk to dt Inverness where most of the restaurants and pubs are located, but easy to take a cab for aprox 6 pounds. We were in town for the marathon and our hosts were ready to support. That included Margaret getting up early and preparing coffee, porridge and toast for those of us eating breakfast at 6 am (five runners staying there). The breakfast were excellent, the bed comfortable and Sandy and Margaret were lovely. We will definitely stay there again should we return to Inverness. Downtown Inverness is about 2 miles walk from the house - return is a bit uphill, but nice. The Hilton Fish & Chips shop is about a 10 minute walk should you fancy them (or need dinner close by on a Sunday evening). A home away from home, dry friendly, comfortable, roomy and just far enough out of town to be quiet and peaceful. Beautiful property with spacious large bedroom and excellent layout. Absolutely lovely host and if i am ever up there again, i will most definately stay there again. Excellent b+b. Very good food, cleanliness and great hospitality. Immaculate accommodation - the best in our visit to Scotland. Friendly hosts who went out of their way to ensure everything was first class. Great breakfast. The visit to Culloden is a must. The room was very clean and properly serviced every day. The breakfast was great with a good choice. The hosts, Sandy and Margaret were fantastic and showed their hospitality. Location is good with easy access to the A9 and retail stores nearby. Variety of restaurants in Inverness. Has easy access to the road which travels past the Loch Ness. 4 vice 5 for location only because downtown bit more than walking distance. No problem if driving. If driving into town parking £1 for 4 hours just upstairs from M+S. Host Sandy full of local knowledge. Also all round interesting gent. Not bad cook, either. This is a lovely B&B. The lounge area with the little extras is a very nice touch. About a 25 minute walk into town, but that didn't bother us. Great way to wear off the meals. Great breakfast. There is a bus stop at the corner if you are not into walking the distance. The home is lovely, the breakfasts delicious, the beds comfortable and the hosts very welcoming and helpful. This home is a bit out of the town center so having your own car is a good idea. That said, the cabs from a he ten center are numerous and the drivers friendly. Also, there are a few nice restaurants within walking distance. Although the location was out of the main area of the community, it was quiet, had great parking and a beautiful facility. The room was clean to the highest standard and the decorating was perfect. Very good breakfast with hosts that were attentive to every need. Una Guest house deliziosa in cui sentirsi come a casa propria. La proprietaria è molto gentile ed accogliente e la mattina prepara un'ottima colazione per gli ospiti. La camera in cui abbiamo soggiornato era piccolina, ma dotata di tutti i confort. La sera prima di dormire è possibile intrattenersi nel salottino sorseggiando un whiskey o uno cherry e leggendo uno dei tanti libri a disposizione. Nei dintorni della struttura non vi è granché, però con la macchina è possibile raggiungere Inverness in pochi minuti. Very friendly welcome. Accommodation lovely, loved the lounge & choice of books. Breakfast was absolutely marvellous. Highly recommended. Nice walk along the river to city centre. Si vous cherchez à manger après 21h (souvent difficile en Ecosse), allez au "Brewers Fayre", Beechwood Park, Sir Walter Scott Drive (brewersfayre.co.uk). Great stay! Breakfast was excellent and the staff was very friendly. It's just outside of city center. If you are up for a quick walk the hotel is a great choice. About 5-10 min walk to the middle of everything. Would highly recommend. La maison est trop éloignée du Centre d'Iveness, le quartier est un lotissement sans charme. L'hotesse est très professionnelle, des attentions à l'égard des clients, whisky à disposition, bouteille de vin en guise de bienvenue, salon un peu petit avec jeux échec, scrabble et livres à disposition. 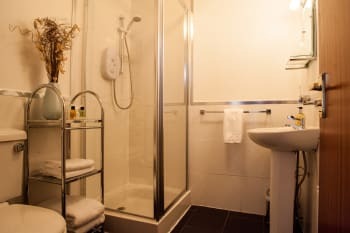 Aide pour les bagages, notre chambre était spacieuse et claire, salle de bain correcte, dommage pour les draps bordeau foncés. Breakfast choix et souci de faire plaisir, mais,pour les plats chauds doit faire des progrès en qualités et préparation. A five minute drive to city center or on the way to Culloden etc. We found a luxury, very comfortable and big room and were very satisfied, except only one thing: the newly afixed blend could not be closed completetly (would be repaired after our departure). As we had room No. 3 in the main building the way to the parking places runs along our room and I felt unconfortable because it was possible to look in our room. So we had to close the other opaque curtain to hide away from the sights, which makes the room dark by day. The modern indian restaurant you reach in a 5 minutes walk from the hotel is fantastish and earns an award. 8 minutes walk and you find public transport to the airport (railway)! Well within walking distance to the center of Inverness. Thanks very much for leaving a review. Best wishes, Sandy & Margaret. We had a fantastic stay at Dunahllin House, we wish we could have stayed longer! The rooms and house are exceptionally well designed and incredibly comfortable, but the shining stars of our visit were our lovely hosts. Margaret and Sandy were the perfect hosts and truly wonderful people. We hope to visit again soon! Lovely house, very comfortable bed. ,big room. Very friendly owner and staff. Lovely breakfast, gorgeous fruit salad. Good coffee. List of all easy to reach restaurants in room. Excellent accommodations. Our hosts were helpful and friendly. We were surprised at the location of Dunhallin House. It is located in a residential area about a mile or so from Downtown Inverness. It was easy to get back on the road to do more sight seeing though. 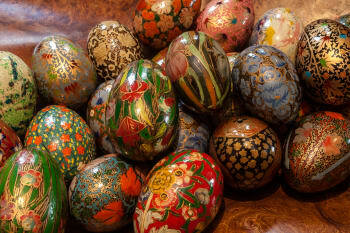 Lovely place, lovely decorations in home. This is a home, not just a house. Thanks for having us and helping us with our travels. Absolutely friendly reception, homely stay and a wonderful welcome. Awesome hosts. Great place to stay and explore Inverness. Very friendly and welcoming on arrival and throughout our brief stay. The breakfast was first class and set us up perfectly for the long day ahead. We had a lovely stay at the Dunhallin bed and brekfast. The rooms were big and clean and the brekfast was amazing! Great bed and breakfast facility. Beautifully kept with lovely hosts and staff. Cannot fault it and would definately stay again. Urqharts restaurant is really good. A trip to Tomatin distillery is also a great day out and you can catch the bus from the city centre if you want to enjoy the whisky. Just great. A bit far out of town if you do not have a car. Excellent experience both hosts were happy to help and advise. Breakfast was a treat every morning, great selection and well cooked and presented. Room was great loads of space and storage. Ensuite was a bit small but had all you needed. The separate sitting room as part of the bedroom was great if you didn't want to go to the communal area. Bed was comfortable bathroom facilities also fine. Would have loved to have a face washer in there though. Breakfast each morning was hot and hearty and a great start to the day. We visited culloden battelfield, Loch Ness and Fort George. All worth a visit particularly culloden information Centre well worth the 8pounds (seniors discount) to get in. Lovely couple lovely home and extremely helpful and welcoming, quiet and comfortable, great beds. Excellent - felt like home even though I was working I was able to relax! Breakfast especially the porridge......... Rooms are very nice , shower pressure great . One small thing change the bathroom air fresheners. We found the Dunhallin House first class, immaculate and it set the bar for all other B&Bs on our tour of the Highlands and Islands. We were made to feel very welcome, the breakfast was excellent and Margaret, the landlady, was very helpful and friendly. Dunhallin House is on a bus route (get off the stop before Asda). It's an approx. 40-minute walk to the centre of Inverness and only a 20-minute walk to Ness islands, from where you can stroll along the river bank into town. City centre is a short drive away,plenty of variety for eating out at the many restaurants,or just get fish & chips in a box and walk by the river Ness. Really enjoyed our two night stay. Great room (no. 1), friendly hosts and great breakfasts. Perfect if you have a car as it's a little way from the town, but still worth staying at even if you haven't. Two restaurants worth visiting in Inverness - Mustard Seed and the Waterfront Bar, but you'll need to book! Fabulous place. The best b&b we have ever stayed. So much attention to detail. Great breakfast. Clean rooms. Nice touch having somewhere to relax away from bedroom. Will definitely be back. This B&B is a 10, not more, not less! Give the Fairways restaurant a miss and take the bus or walk into town for more choices. Great place. Big room. Good amenities. Outside the city center, so very quiet. Although just one night's stay, we felt very welcome in a lovely home. The option to have a seat in a quiet lounge and enjoy a complimentary drink was most hospitable, even though we didn't partake due to driving the next morning. Immaculately clean and beautifully decorated house. And having private parking was a definite plus. Thank you. Really nice comfortable B&B. Nice quiet location. Really friendly and servered a great breakfast. This is the best B&B hotel we stayed in the recent trip to Scotland and Ireland/North Ireland. The breakfast was fantastic, and the parking was just outside and free. The owners were most friendly and helpful. The location is residential and very quiet. However you'll need a car to go anywhere. For us, everything was ideal so thank you very much! Posto bellissimo, arredamenti interni belli e molto accoglienti. La proprietaria è gentilissima. La camera è molto, molto spaziosa e pulita. La colazione, con vasta scelta, è deliziosa. Lo consiglio. Thanks again for your kindness and friendly welcome. We had a lovely weekend, slept well in a very comfortable bed and enjoyed the breakfasts. Delightful place to stay, and easy to get into town. Very comfortable, great breakfast! We will definitely come again. Thank you. The room was exceptional. A real home away from home. Breakfast was delicious and the service was friendly but never fussy. We booked three rooms for five people all of which were very clean and comfortable. Owner Margaret was hugely welcoming throughout our stay. Breakfast choices were excellent and prepared to perfection. We appreciated the fresh milk and bottled water available in each room daily. Location was fine for us and very quiet at night although some may prefer to be slightly closer to Inverness centre (5-7 minutes by taxi). Plenty of parking space available on site. Fig and Thistle restaurant (Stephens Brae) was excellent in every way. Our visit to Mustard Seed next night was not so good (piped music way too loud necessitating a few requests to turn it down and 2 in our group ordered rib-eye steak which was very tough and remained unfinished. Whilst we mentioned this to waiter no adjustment was made to bill. We had a very nice stay at Dunhallin House. Comfortable, spacious, clean rooms and a very good breakfast in the pleasant breakfast room. Sandy and Margaret were friendly and helpful. Highly recommend. 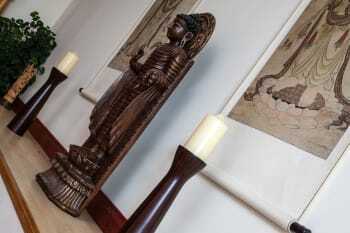 Warm and friendly hospitality, lovely spacious room and great breakfast with an excellent menu choice. Certainly will be recommending and looking to come back again soon! Great place to stay just outside the centre of Inverness, big Asda nearby to get supplies for an onward journey into the highlands if you're making an early start. Great!!! Thank you for all!! The breakfast was super!!! Warm, welcoming, spotlessly clean house. Margaret is a very pleasant and helpful hostess. Well appointed bedroom and shower room. Brilliant breakfast choice! Situated in a residential area some distance from city centre. Large supermarket and small shop within walking distance. Bus service into town but check timetable posted at bus stop. Welcoming and friendly people . warm and comfortable room . hopefully we will be able to stay longer next time we are in the area. Made to feel very comfortable and at home. Good location for airport on route back from whiskey tour as only 20 mins drive from airport. And close to Inverness. 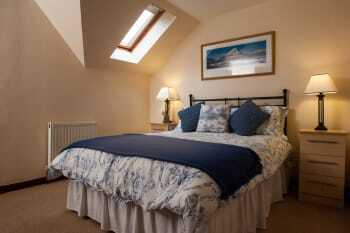 Lovely B & B if you are staying in Inverness, short taxi ride to to the town centre. Proprietors very friendly & helpful, beautiful clean well equipped room & a very hearty breakfast, would definitely recommend. We stayed in Room 2 & 3 & both were equally as good. As always, extremely welcoming and helpful. A great vantage point to explore Inverness. We find Mustard Seed restaurant very friendly, and the staff are top-notch. Leakey's 2nd-hand bookshop is wonderful. We're gradually finding our way around the city. Lovely clean B & B, Sandy & Margaret were very welcoming & friendly. Well equipped bathroom & lovely breakfast with plenty of it. Highly recommended place. No place before as clean as this one and bed really comfortable. Breakfast is incredible in quality and quantity. On the other hand, owners make you feel like at home. Thanks for everything. Almost all kitchens at Inverness close before 21:00. Be aware of that! Nice hotel with clean comfortable room with good facilities and an excellent breakfast. We're delighted you enjoyed Dunhallin. Many thanks. Margaret & Sandy. Lovely welcome when we arrived and shown to our room which was large and very clean. The owners are friendly and always ready for a chat with there guests. Exactly what we expected. Lovely accommodation. Lovely hosts. Fabulous food. What more is there to say. Thank you. Lovely welcome. Home from home. Great breakfast. Very nice room. We tried Mustard Seed restaurant by the river. Excellent food and happy staff. It was such a lovely staying especially in a raining day, the landlord and landlord lady was extremely nice and they gave us a big and warm welcome. The room is cozy and tidy, with enough heating. Bed is soft and warm, the washroom is clean, everything is absolutely perfect. Breakfast is good, the landlady is really good at cooking I think. Will definitely recommend to other travels and will come over again. I couldn't find the remote control for the TV but worked manually ok.
have stayed in a few B+B's and this has to be one of the best. Staff were friendly, helpfull as well as able to take the time to answer a few questions from my partner she had regards the area as well as how difficult it is to run a business like they had . Well worth a booking if you are staying in the area. Asda for the bits and bobs that you might need as well as a pub that served food both with in 10 min walk. Best porridge ever, lovely breakfast, very comfortable surroundings, friendly hosts. We are two very indecisive sisters and we just said: lets go to this place! What more can you do to please two indecisive people that just took a quick decision than arriving in the perfect atmosphere that this bnb has? Really! Dont overthink! Just book this lovely place and have a blast here! We were at the whole time saying: ahnnnnn! Owners are amazing and so thoughtful, they leave cookies in the room, and tea, and rooms have a nice view to the mountains, really cozy place. Love the decoration! I hope I was convincing enough. Love there! Stirling castle, loch lommond, lock ness. We rented a car and it was so nice to see the amaxing landscapes! Thank you for a lovely stay and delicious breakfasts! A lovely place with even lovelier owners. Our room was spacious and tidy, perfect to collapse in after a day of highlands sightseeing! Excellent breakfast and excellent services! Very welcome host, beautiful house. Superb breakfast. Warm welcome and helpful and pleasant at all times.Facilities and food excellent. Lives up to all the reviews that we had seen. Good information pack gives lots of interesting facts. Will certainly recommend. We have stayed in a lot of B&B's but this one beats them all. Very comfortable. Would highly recommend. Very spacious comfortable room with a sitting area in bedroom to relax in. Friendly welcoming hosts. High standard of cleanliness. Extensive breakfast menu, freshly cooked to order. Porridge is amazing!! This B&B has everything you can expect and more. Plenty restaurants in Invernes and much to do in city. Great access to Loch Ness. Excellent place to stay, food was superb. I was visiting the area on business and this facility suited me and my wife. On the outskirts of Inverness with good access to the A90. A good bed and breakfast with friendly staff and a property in very good order, very well designed and decorated. Mattress and pillows a bit too hard and en suite was small but overall it was very comfortable. Breakfast excellent. Off street parking spacious. The Fairways Restaurant is a five minute drive away. It served good food and an excellent range. I had an excellent roast dinner. It would have been helpful on Booking .com if you hadn't been suggested as a City Centre located property and that the walking distance from Centre was a little more obvious in its description. Also it might be nice to have a little background music in the breakfast room. Silence or whispered conversation amongst guests is always a little uncomfortable. Also helps break up the various crunching and slurping noises from diners. It's a good 30 minute fast walk from City Centre so good shoes advisable. Very comfortable and friendly owners. Breakfast excellent. Could not be bettered. £5 for cab ride into Inverness town. Plenty of good restaurants there. Lots to see and do in Inverness. Kitchen Brasserie is excellent, as is The Mustard Seed. great breakfast.fantastic owner ,very lovely house,peaceful,no faults whatsoever. We loved your house as soon as we walked in, your friendly welcome was very much appreciated. The cleanliness and comfort of the room was to die for, breakfast was plentiful and well served and hot. We will recommend you to our friends on Facebook. The location just 15 minutes by bus out of the city, is ideal because you are in a quiet neighbourhood, (another bonus). We will return in the future thankyou. For a quiet, friendly, clean comfortable stay, you cannot fail to appreciate the offerings of this highly recommended Dunhallin Guest house. Leave the car, take the bus 15 minutes into city centre. Location provides parking and is a short dive to city center. Best place to stay. So happy we "lucked " upon it. Our host ,Sandy and Margaret were lovely,helpful,charming. If staying Friday's and Saturdays plan to eat early and possibly book ahead. Inverness is a busy town on weekends. Otherwise there is a good ,pub type meal, at the fairways golf range. Our stay was too short and as such did not have time to properly appreciate Inverness. The quality of the room and the tranquillity of the home overall was immediately noticeable. The hosts were very welcoming and unobtrusive. Margaret and Sandy are the best! Very caring and attentive to whatever you might need - cheerful and warm. Dunhallin House is beautifully located to anywhere you want to go. It is sweetly appointed in every aspect - from the reception area, the dining room, the lovely little refreshments table and library. Our room, of course, was the highlight. VERY comfortable beds (so thrilled about that) with crispy white sheets and perfectly fluffy comforter. The bathroom was spotless, the water hot and the shower was great! We loved Dunhallin House. There are hundreds of them in Inverness, but I am so happy we found this little gem and wouldn't hesitate to return. Thanks, Sandy and Margaret for making our week in the highlands so comfortable! We did as much as we could - Urquart Castle is impressive as is Culloden Moor. There are a lot of things to see and do. We drove up the coast to visit Dunrobin Castle - beautiful in the North Sea. We loved that Inverness is much more low key than Edinburgh. Our week there (middle of September) was perfect weather! Rented a car, first-time left-side drivers and mastered it almost immediately. We were surprised at how natural it felt. Just had to be very mindful of that left curb and the roundabouts. You'll love the friendliness and warmth of Inverness! Excellent. Spotlessly clean, comfortable, well appointed, superb choice and quality of breakfast. Margaret and Sandy could not have been friendlier or more helpful. A real credit to B&Bs and the hospitality industry in general. Lovely stay. Room very nice with a separate sitting area. Mini frig was a bonus as was having chilled bottles of water in the frig. Nice to have a drink in the evening. Margaret was extremely nice. Breakfasts were great(too much,actually). Fresh fruit cup was very good. Would stay there again. Downtown which can be reached by bus or foot ( little over a mile)if it is not pouring rain.downtown filled with shops,restaurants and many historical buildings. Thank you for such a warm welcome. The room was lovely, nicely decorated with some very thoughtful extras. Superb standard of cleanliness. We look forward to staying with you again very soon. Bar 27 was a great dining venue. Would recommend the Scottish tapas and the Surf n Turf. Margaret & Sandy are wonderful hosts. Everything was as good, or better than expected. We'd stay again. We loved our stay in Dunhallin House. We had a beautiful, very clean, room. The B&B has a take-one leave-one bookshelf and a fantastic collection of books to browse about mountaineering, Buddhism, and The Rolling Stones, as we'll as other books, in a lovely sitting area. Dunhallin house is a bit out of town - about a five minute drive - but is worth the effort if you are looking for a comfortable, quiet, clean, relaxing stay. Breakfast was top notch. Dinner at The Mustard Seed was excellent. Inverness Museum very interesting and well worth a visit. Driving in Inverness is a bit confusing. You will need maps and patience. Quiet location, room itself very spacious. The cleanliness of the room, bathroom and whole house was immaculate. However, the pillows were terrible. Very lumpy (washed in machine maybe?) - the mattress was not very comfortable either. It would have been nice to have been asked at breakfast the first morning if everything was OK, the lady serving the breakfast was very nice and did a great job but she was very busy with a full room. We didnt see a single person otherwise apart from meeting Margaret on arrival and as we were leaving. How do you contact a member of staff? We wondered if you rang the B&B number as we couldnt find anything in Reception area or in the welcome folder? I dont like raising issues via feedback or on public websites I would rather say in person, that proves difficult however when there is no one around or no contact number left at Reception. I do appreciate you dont want to be 'breathing down guests' necks' so to speak but a small notice with a number should anyone need Mgt or have a problem, is essential. 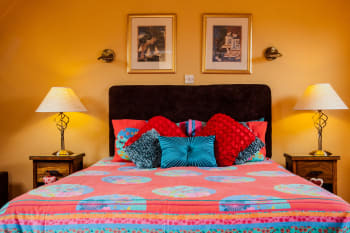 A good sleep is also essential if you are going to enjoy yr break and I felt this aspect of the stay was very lacking for the price of the room. The quality of the bedding was that of a £40 a night room. Pls go to room 1, look at the pillows especially and see for yourself. They need replacing. Cleanliness is very important to me and that aspect was excellent, the breakfast was also good however, I wouldnt come back as a comfortable night sleep is what I would get at home, why pay for a bad one? I wont be leaving a review on Booking.com. Absolutely loved staying there. Clean, comfortable and lovely people always helpful accomodating and kind. The house is so calming especially after travelling all day with tours and adventures. I was made to feel comfortable and welcome. Would highly recommend it to anyone I know and even those I don't. Lovely experience. There is a bus that goes by close to the house, but I used taxis a lot, and even then it wasn't that expensive, from £6.70 to £7.80 max. There is a supermarket you can see from the road turning into the street, maybe 15 min walk. I mostly ate in the city. Bella Italia being my fave restaurant. I had a busy time there but enjoyed Inverness much better than Edinburgh. 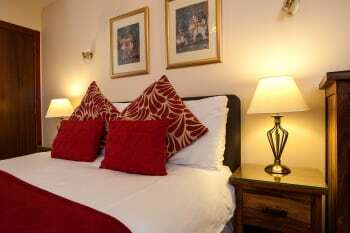 A well presented B&B.. Great room service with comfortable bed and good bathroom facilities. Large TV screen and settee provided within the bed sit room. A wide range of selection for breakfast menu was available. Also access to a larger Lounge room was available. You felt very much at home. Good value for money. Use Inverness as a base to visit the picturesque Black Isles. Culloden Battlefield Visit is a must. Very gracious, friendly and accommodating hosts. We felt very welcomed and at home. We enjoyed good food with fair prices at nearby, convenient Fairways Golf restaurant. WOW! What a great B&B. Reasonably close to city centre and all the facilities you could want. Very comfortable room and good breakfast. Two nights were not enough. Extremely hospitable and keen to help and advise. Attentive and welcoming hosts which is most appreciated whilst travelling away from home. 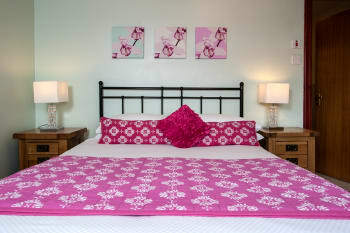 Very comfortable bed and bed linen. Beautifully decorated accommodation. Closest restaurant (walking distance), is Fairways restaurant attached to local golf club. Great value meals, cooked well and good selection to choose from. Very well presented clean and friendly wonderful breakfast. Lovely big rooms very comfortable and welcoming. Breakfast was amazing the best we had on our Europe trip. Restaurant recommendations were excellent. Drive around Loch Ness was amazing. If travelling down to Edinburgh you must stop at Pitlochry and the Edradour Whiskey distillery the tour is fantastic. Also stopped at The House of Bruar for amazing Scottish products and food tasting was a must do. This was our first ever stay at a B&B and it didn't disappoint. The welcome is very warm, the accommodation first rate and the breakfasts superb. We would highly recommend The Blavk Isle bar for a fantastic selection of organic beers and hand made pizzas. If looking for something more upmarket then head to the Rocpool Restaurant but make sure you book as it is very popular. Margaret and Sandy were very kind hosts and our room was very clean and comfortable with all we needed. The breakfasts are huge and cooked to order. Very nice! Very pleasant stay! Thanks very much! A very kind host. A beautiful house and good breakfast. Wander around,do not return back on the same road, try off crowded routes. Very nice room. Friendly service. Excellent breakfast. Nicely appointed facility. Only issue is that this property is not close to restaurants. Nice location in a quiet area. Very good breakfast. Everything was just perfect, from the welcome to the leaving. Sandy and Margaret are perfect guests. Their house is pretty comfortable and in a quiet area, very nearby downtown. Strongly recommended. B&B is 5' away from the heart of the city. Traffic can get heavy in the morning and in the evening as there is only bridge in the whole area to cross the river. Need to be cautious about it, or to drive via by-passes, and there are some. Excellent room and breakfast! Comfortable bed and very kind and friendly owners. We enjoyed our stay. The house is lovely and our room is big and roomy. We really enjoyed the extra sitting area in the room with a nice comfy love seat for us to watch TV and send emails home (instead of sitting in bed to do them). The breakfast was great, lots to choose from. My husband really enjoyed the porridge and I loved my fruit salads. The lounge area was very comfortable and guests were offered whiskey or sherry, and we took advantage of this after a long day out. Margaret our hostess is good at recommendations on restaurants and she will make reservation for you. Make sure you make the restaurant reservation if you are in Inverness on the weekends, the popular ones are always full. On the way to Inverness, Fort Augustus and Chanonry Point are worthwhile to visit. Second visit and will not be the last. Superb throughout and Service/Staff should be rated higher. The extra touches - fresh milk/a dram, makes all the difference. Plenty to see and do in this area, information brochure provided in bedrooms and if you like a curry The Rajah in Post Office Lane is the best and for a snack or lunch you cannot beat Girvan's on Stephen's Brae. You should have a car to stay at this location. The facility is delightful. Breakfasts were amazing and the staff was helpful and charming! We wished we would have stayed here longer! Book tours and take time to spend in beautiful Inverness and it's surroundings. There is so much history and beauty in this part of Scotland. This place is spectacular! The rooms are large, shower works well, internet is fast, and breakfast rivals anything you would get in a five-star hotel. I highly recommend this location and we will stay there again. Nothing short of sensational! It is located in a fairly busy part of town and is close to downtown. Make sure you have good directions though. It's easy to get lost in town (well, in Scotland for that matter) with all the roundabouts. The home was beautiful and the room was absolutely perfect. There was a couch, a TV, a DVD player, and a fridge. Oh, and we were grateful for the Wi-Fi too. We were very pleased with our visit! Our GPS had a little trouble getting us there. Good hotel at a convenient location about a mile from Inverness. Facilities are a bit old though quite well maintained. No air conditioning. Limited TV coverage eg no golf channel. Short drive from Inverness. Good for a stay before taking the cruise. A very clean, comfortable and spacious room. Everything worked very well. Breakfast was of high quality. Unfortunately we only stayed for one night, we arrived late evening and left in the morning. First class hospitality from Sandy and Margaret. Lots to see and do in Inverness, from a walk along the river to a wander through the Victorian Market, rounded off by a visit to one of the many friendly local bars, where good food is served. Very warm welcome and well looked after. Breakfast was superb and the room extremely comfortable and clean. Lovely guest house in a good location. We really enjoyed our stay and will definitely come back next time we are in the highlands. We had a brilliant stay! Have already recommended to friends! Very beautiful, calm location. Great service from Sandi and Margaret. We lived our stay! Hosts very friendly, Margaret made us feel at home she always had a cheery smile. A lovely person she couldn't have done enough for us. Had a lovely meal at Fairways -Margaret recommended this place. For dinner we recommend "the waterfront", 70 Huntlystreet. I got a "snooty" feeling from the person who met us. I would still recommend the place though because it is nice and we only stayed one night so it was hard to get a real feel for the place. First impressions of people are not always correct. We had a very nice room. Our hostess and host were very friendly so we felt very comfortable. The room was clean, bed very comfortable . They had a nice sitting room and many books available to read or just look at. There was a golf course very close by, 10 minute walk and we had a very nice dinner there. Great space. Very helpful hosts. Top notch guest house. On site parking. Delicious breakfast. DVD and book collection. Time to relax. It's nice place with a sympathic staff but it is a too noisy place for me. Intimity is far to be guaranteed and sometimes I had impression to live with my neighbours. You can stay one day or two maximum. If you are searching for a calm place, you can pass your way. Although a little out of town, Dunhallin is easily accessible to it. Absolutely everything else about the services and facilities, though, was first rate. Very accommodating hosts and a splendid breakfast with a well-appointed room including, thoughtfully, a fridge. Thank you for a wonderful stay. You made us both feel so welcome. You have listed the good local places to eat, battle field site worth a visit. Très jolie chambre, petit déjeuner excellent, personnel sympathique. Location was not convenient for downtown restaurants or for walking to anything interesting. There was a market nearby and that's where we bought something for dinner. We didn't want to eat at the local golf course or get back in the car and handle the traffic after a busy day of travel. Everything else was fabulous. The hosts do a great job providing comfortable accommodations with an excellent breakfast. Head south along Lock Ness. Perhaps check out Culloden Battlefield or Stones of Clava. We didn't because of time. Clean,friendly and a really excellent breakfast. Wouldn't hesitate in recommending Dunhallin to anyone. Lovely stay in an excellent guest house hosts very welcoming and friendly and breakfast was delicious. Hope you have a busy season. The attention received was very kind. The bedroom, bathroom and breakfast was absolutely perfect too. We highly recommend it ! These are small niggles but it woould be good if they could be attended to : Suggest that a spare toilet roll is available in the toilet itself. Suggest also that a toilet brush is put there. Otherwise all things are very good indeed. Clean and quiet place and good breakfast. Nice venue, warm welcome, excellent breakfast first class service. Inverness has alot to offer. Trip was fleeting, but just going to loch news was magic. There is a super litte inn at Dores just 8 miles down the loch...serving good coffee and with lovely views. A little far out of inverness but otherwise excellent. Very confortable and quiet place! Staff very kind!! I must say it was all perfect, nicest b&b I have ever been before. Caring and lovely attention all time, I cant ask more. Thanks a lot for these beautiful nights. Excellent place to stay. Room was clean, spacious and modern. Breakfast was also very good. Will definitely be staying again and will be recommending to friends and family. Fabulous B and B, owners and staff excellent, will definitely be back and will be recommending to friends. Very friendly warm welcome very assisting a Brilliant Breakfast I didn't want the Rabbit stuff that wasn't a problem they gave extras highly recommend their rooms , themselves and of course the Breakfast they simply can't do enough for you that's how obliging we found them . Very welcoming hosts. A lovely spacious room with tea and coffee facilities. Delicious Cooked breakfast to order. Guest lounge area, off street parking and close to Inverness city centre. I only stayed for one night and did not explore so cannot comment. Friendly, accommodating and kind Highland hospitality. Very comfortable bed and great facilities. A highly recommended B&B. Provided everything I required with an excellent breakfast. Plenty of room for parking. This is a superior B and B offering a home from home experience. The owners and staff are very friendly and helpful. Breakfast menu has something to suit all tastes. Room was spacious and clean and the bed was so comfortable. parking was excellent and the town is only a short trip away. This was one of the friendliest & most organised stop overs I have ever made. Right from the outset prior to visit, I was alerted to the change in description of the property due to upgrading of outside facilities, ensuring we found the property easily. Personal greeting, fresh milk for in room refreshment. A warm and friendly reception area. I only stayed overnight as a stopover. I did however eat at a local Italian restaurant, Little Italy. The food was of good quality and the service & atmosphere was all I'd expect from a restaurant. This is a warm and welcoming B&B and we're very pleased we chose it. The room was large and very clean and comfortable; the breakfast was excellent; and the owners and the lady serving breakfast were friendly and helpful. It's a bit out of the centre of town, which might not suit everyone, but we'd recommend it highly to anyone visiting Inverness. Fabulous place, so welcoming, so organised, beautifully clean and well maintained. Breakfast was fantastic everyday. Rooms are well stocked with all you will need, just bring your clothes! Fantastic value for money and Margaret was very helpful. Room was spotless and very comfortable. Breakfast was very good and set me up for the day ! Couldn't recommend this B&B highly enough. Was like a top notch hotel on a smaller and more personal scale. Breakfast was excellent. Shoot over to the West Coast for a day trip. Return to the comfort of this hospitable B&B. Lovely room and en suite. Very friendly helpful owner. Very tasty filling breakfast. We will definitely stay here again if having another night in Inverness. Riverside restaurant on bank street was a lovely small cosy place with very good food at a great price. Lovely B&B - rooms were a great size, very clean and comfy with everything you need. Good breakfast to get us on our way in the morning. only a 5 min drive down to town. Loved it, definitely recommend! Very relaxed atmosphere friendly hosts and staff. Our room was lovely with tea and coffee making facilities available in our room. Very much home from home sense. Breakfast was tasty and filling and our breakfast host extremely pleasant and looked after us well. When booking however check the distance from station as it's not just a five minute walk, I found this out as I hadn't checked the walking distance. Taxi will take around five mins whereas walking is around forty five! A little out the way for going in and out but worth the stay there. A beautiful home to rest after a long day. The rooms were comfortable and nice and the owners are friendly. Absolutely first rate.....wish all B&B were this good !! Friendly and helpful hosts . Absolutely loving stay! The kindest hosts and the better breakfast in all Inverness. Definitely recommended! 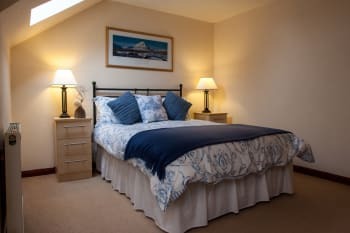 On-site parking, friendly welcome, clean and spacious well decorated room, exceptionally comfortable bed, well equipped with tea/coffee etc, quiet area. The breakfast was freshly prepared and absolutely delicious. Fantastic breakfast, very friendly hosts and staff. Our room was quiet, very comfortable bed, well appointed room. Short walk to a golf course complex, with good pub-style food. While this is a really good place to stay, it is quite a long walk into town. There is a bus stop nearby. Very welcoming host. Great facilities in room and the public area. Everything spotlessly clean ... and a great breakfast to finish off with! Visit the Whiskey Store and other shops in the town Centre. Several tourist attractions too. A very warm welcome from two excellent hosts. Always happy to help. We ate at Zizzi's, Bella Italia and Corrigarth Hotel. Pleasant welcoming staff, lovely room, good breakfast. Breakfast is a little earlier than I'd prefer - especially for a weekend - but the rooms and decor are very pleasant. You could certainly do a lot worse. Nos sentimos como en casa. La dueña nos ofrecio su salón, que resultó ideal para disfrutar de su colección de libros acompañado de una copa de whisky. Encantadora estancia. Esperamos volver algún día. We felt right at home. The owner offered us the lounge, ideal to enjoy her collection of books while sipping whiskey. Lovely stay. We hope come back someday. First class indeed, keep up the good work. Inverness is a place that you can easily avoid during your travel in Scotland. 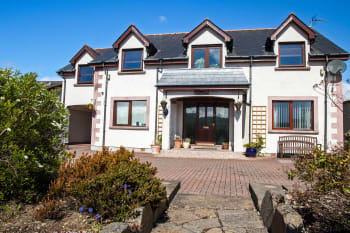 Lovely house with excellent facilities and a lovely Highland welcome. Nice touch with the complementary nightcap, most enjoyable. We loved our stay in Inverness with you. Thanks for your helpfulness and service. It was a pleasure to meet you. Marjorie was a delightful host, warm and welcoming. Our room was spacious and very clean, bed was comfortable, breakfast was amazing. We highly recommend this B&B. Sandy and Margaret are wonderful hosts who will provide a warm and comfortable atmosphere and delicious meals. Your hosts have the knowledge and resources to recommend and guide you to whatever you need. This is a beautiful property where you can feel relaxed and like being at home. What a find, this is the best guesthouse we have ever stayed in. The welcome from Margaret on our arrival was warm and friendly and the room allocated to us was outstanding for comfort and cleanliness. Breakfast was excellent with very good choices, generous helpings and very good quality. Will we return? Most definitely! Rather than drive or walk into town, we caught the bus from the nearby stop and got a taxi back. Very convenient. We had dinner at the Cafe1, upon your recommendation, we had a lovely evening ! A quiet location but far from center. Very nice and clean house, very big room very well equipped. Margaret is soooo nice. very good breakfast and friendly owner. stable wifi. Thank you so much for leaving a review, and for choosing Dunhallin as your accommodation in Inverness. VERY hospitable innkeepers (Margaret and Sandy). The breakfasts were top-notch - so many choices and ALL delicious. Take a taxi to Inverness if you do't have a car and the trains will take you anywhere you want to go. Taxi is anywhere from 7 to 10 pounds one way. On a sunny day, Nairn was one of our favorite destinations. A sleepy little coastal town with WIDE sandy beaches. We bought a blanket, wine, bread, cheese and chocolate and enjoyed half the day there. Delightful owners Margaret and Sandy. Very accommodating and the rooms were very comfortable. Wonderful breakfasts and over and beyond service! The Mustard Seed restaurant is a must! Cafe One was very good and so was Rocpool. The Castle Tavern was horrible, and would not recommend it. I would recommend Dunhallin House to anyone visiting. Margaret and Sandy were so generous and accommodating, including packing a lovely takeaway breakfast to take on our tour and spot on restaurant suggestions. Very nice and friendly owners and staff. Margaret went out of her way to help and make us comfortable! Guest house is very roomy and homey! Good stop in the road for us and good home base to take Kyle train and day tour of Isle of Skye-a must see! Mustard Seed is excellent-a nicer dining-make a reservation unless going early. Johnny Foxes good pub food and more! Inn about half hour walk from town-little further than I thought-however taxi and bus are easy. Train station small and easy as well. All the staff at Dunhallin House, Sandy, Margaret and Judith, were very friendly, cheerful and helpful. hey made us feel most welcome. There is a handy Co-op shop nearby with newspapers, food and drinks etc. The walk into Inverness centre is straightforward and takes only about 30 - 40 minutes. Sandy provided excellent information and advice before we walked up Ben Nevis and was an excellent guide whilst we were on the mountain. Everything is fabulous and we really really enjoy our stay at dunhallin house. Great and quite location, nice and friendly staff, delicious breakfast (my mother really loved it and thank you). Overall, it gives us an experience of FIVE STAR!! Its really great for relaxation. We haven't gone so far just hanging around. An information book about places that could go is provided in the room and it worked quite well. Great breakfast! Would have liked wash cloths. We received excellent service. The hostess prepared a special breakfast for us to take with us the very early morning we left for the Orkney Islands. She also arranged taxis service for us. All the staff were very kind and helpful. The 14 hour trip from Inverness to the Orkney Islands was excellent. We would highly recommend it. Wonderful guest house and caring couple. Nothing is too much trouble. Sandy was fantastic as our Guide to climb Ben Nevis. A truly fantastic experience we can not thank you enough. Delightful hosts and in a pretty location. The room was excellent and the breakfast sumptuous. Margaret and Sandy were a very friendly couple and the accommodation really was excellent. Would have no hesitation booking here again if we go back to Inverness. The golf club (Fairways) has a very good restaurant and is within easy walking distance of Dunhallin House. Culloden battlefield is a short drive away and if you go into Inverness recommend parking in Eastgate. Good walks around the city.